There is a solution to our current economic stagnation which does not require further government stimulus i.e. spending or further tax cuts. While this concept isn’t one that either President Obama or former Governor Romney wishes you to consider, give me five minutes and about 850 words and then you be the judge. To begin with let us try to agree on a fact which both parties would prefer you ignore: the U.S. economy simply has too much debt. We accumulated the majority of this debt over a 25-year spending binge from 1982-2007. Whether anyone wishes to admit it or not, our nation has been living beyond her means since before Ronald Reagan proclaimed, “It’s morning in America.” A quarter century of indulging our wants at the expense of accumulated debt provided a false illusion of prosperity. While a handful of conservatives such as myself deemed this mountain of debt collected across generations of Americans to be the primary cause of the 2007 Recession, we were in the minority. The majority opinion on the Recession contended it was just one more postwar recession—a serious recession, yes, but a cyclical one, a recession that easy money, government stimulus, and a return of "confidence" could fix. In the half-decade since the Great Recession began, popular opinion has evolved. Today a growing number of economists have redefined it. They argue that the Recession was actually fundamentally different—a "balance sheet" Recession resulting from a quarter-century-long debt-binge, one that would take a decade or more to fix. This growing minority is pointing out the U.S. economy is behaving exactly the way other economies have behaved after piling up mountains of debt. While they remain in the minority, none disagree the economic recovery has produced disappointing growth, high unemployment, and understandable social unrest. Now if you are looking for the instant gratification, “silver bullet” solution, stop reading right now. It took America 25 years to bury itself under our current mountain of debt. Developing the leverage to dig our way out is going to take time. Further, neither candidate’s conventional political platform position on fixing the economy addresses the fundamental problem. Romney says we should immediately cut taxes and cut government spending, thus freeing the private sector to fix the economy. Obama says we should continue to invest in education, infrastructure, research, and other programs, thus helping the economy heal itself and improving the country&apos;s human and industrial capital. Yet neither plan comes close to actually balancing the federal budget. Neither party addresses the "balance sheet" recession of consumers triggered by too much debt. Consumers, who make up 70% of America’s GDP, remain the key to recovery and growth. Consumers since the onset of the Recession have begun to pay down their debts. For once, Americans appear to understand that you can&apos;t solve a debt problem with more debt. Specifically, you can&apos;t reduce the amount you owe by borrowing more. 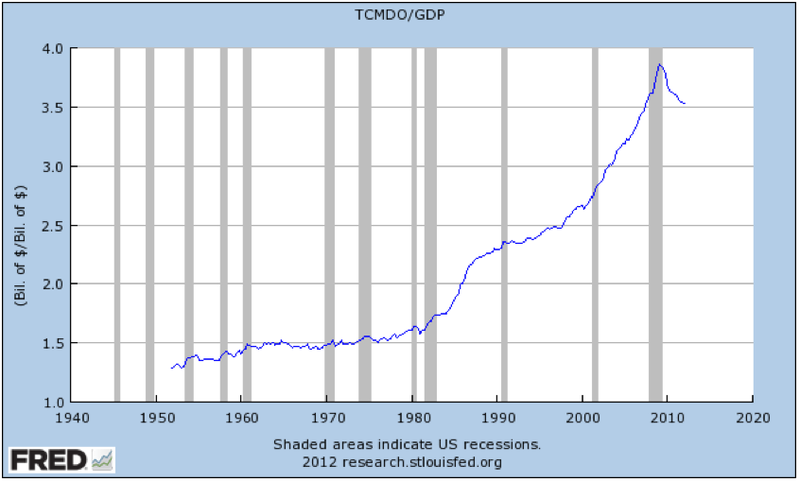 Which brings us to the following graph concerning the American economy prepared by the St. Louis Federal Reserve. Now call me skeptical but I have a hard time believing, neither major party has noticed American corporate profits are near record highs. Furthermore, as I reviewed previously American corporations&apos; record profits have led to somewhere between $1.75 trillion and $5.6 trillion in liquid assets depending on whether your wish to believe the Federal Reserve’s or the IRS’s most recent estimates. Effectively, American corporations have somewhere between twice and seven times the amount of the 2009 federal stimulus sitting around collecting an effective negative rate of return when adjusted for inflation. While there are many factors which have led to American corporations reaping record profits, the fact that “real wages” adjusted for inflation are at their lowest levels since the end of World War II is a tribute to the productivity of our workforce and arguably a key to future economic growth. There is a very simplistic long-term means to both leverage American consumers out of their debt loads and grow the economy namely marginally higher wages and increased hiring. Before my friends on the right decry increasing wages as an attack on our global competiveness, the last time I looked, if you don’t make a sale, nobody makes any profit period. With the EU struggling, emerging markets&apos; growth slowing, and even China battling to maintain targeted levels of expansion, American consumers are the key to both recovery and long-term growth. As for my friends on the left, remember the term "marginal." In today’s globally competitive environment, wages must be justified to assure the ongoing concerns of any business. The well-documented liabilities of the EU’s compensation system provide a lesson America cannot ignore.